Guest post by Bernz Caasi. My mom was in tremendous shock when I came home one day and told her to burn all our religious statues. For a moment, she thought that I was out of my mind. Our family had always been Catholic, and my grandparents gave us several religious icons that I grew up with – a statue of Our Lady of Fatima, pictures of the Last Supper and the Agony in the Garden, statues of the saints like St. Martin de Porres, rosaries, prayer books, etc. “But we never worshiped statues,” my mom desperately reasoned to no avail. Then I did what all born again Christians would normally do – quote scriptures. “Mom,” I started, trying to keep my calm knowing how mistaken she was. “The Bible is telling us in Exodus 20:4-5, ‘You shall not make for yourself a graven image or any likeness of anything that is in heaven above, or that is in the earth beneath, or that is in the water under the earth: you shall not bow down to them or worship them.’ It was also written that people sinned against the Lord by making for themselves “gods of gold” (Exodus 32:31). Then my mom did what many Catholics would do when confronted by a bible-quoting Christian – be silent. And for many years she was silent. To avoid further arguments with me, she silently kept the statues, hid the rosaries, and removed any signs of Catholicism in the house. 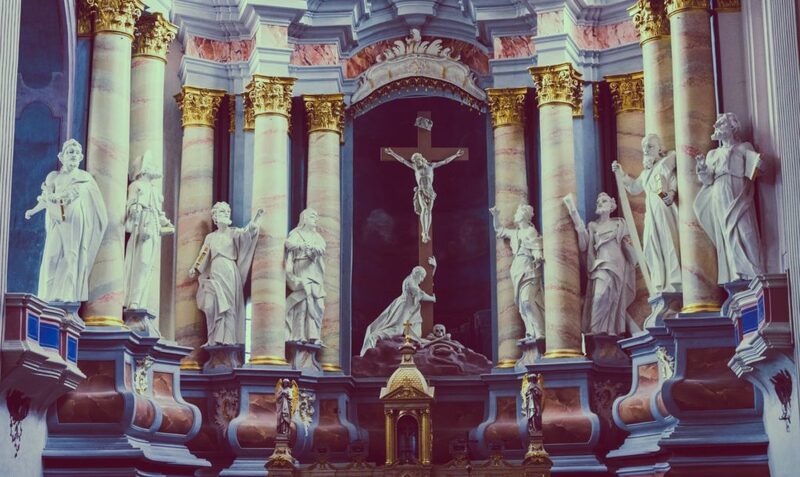 In my own journey of faith, I have realized three things about the statues of the saints. God actually commanded the creation of statues. “And you shall make two cherubim of gold [i.e., two gold statues of angels]; of hammered work shall you make them, on the two ends of the mercy seat. Make one cherub on the one end, and one cherub on the other end; of one piece of the mercy seat shall you make the cherubim on its two ends. The cherubim shall spread out their wings above, overshadowing the mercy seat with their wings, their faces one to another; toward the mercy seat shall the faces of the cherubim be” (Ex. 25:18–20). That made me doubt my Protestant beliefs and made me want to “search the Scriptures” (John 5:39) even more. As I dug deeper, I also saw that in another instance, King Solomon made a temple for God with carved figures of cherubims, palm trees, and open flowers overlaid with gold (1 Kings 6:23, 27, 29, 31, 32). That question stayed with me for many years. Why did God prohibit the making of graven images and then at another instance demand it? There must be an explanation that would make sense. I tried asking my Protestant friends, but many of them were not even aware that God allowed statues to be made in the first place! That’s when I realized that perhaps my mom was right – perhaps at least on this aspect Catholics could be right. As I read more about the topic, I realized another surprising truth. God even used statues and other material things to transmit graces. Prior to becoming Catholic again, I also abhorred the use of religious icons (statues and images) in the context of healing. For me, that was not just idolatry but superstition. And yet, I was unaware that Scriptures spoke of how God used material things to transmit grace. I read in a Catholic Answers tract that during the exodus of the Jews, there was a plague of serpents sent to punish them. Moses could have simply told his people to pray for deliverance, but God had another plan. He told the prophet: “”make [a statue of] a fiery serpent, and set it on a pole; and every one who is bitten, when he sees it shall live. So Moses made a bronze serpent, and set it on a pole; and if a serpent bit any man, he would look at the bronze serpent and live” (Numbers 21:8–9). In the New Testament, God also worked through St. Paul “so that even handkerchiefs and aprons that had touched him were taken to the sick, and their illnesses were cured and the evil spirits left them” (Acts 19:12). Mind you, when I read those passages, I was completely blown away. I finally understood how I misunderstood Catholics all along. Clearly, God in His wisdom and power can work through material things. Clearly, God did not abhor nor prohibit the creation of statues (and other religious icons) and their use in right religious contexts. Reading Exodus 20:5 once more, I also realized a simple but fundamental detail in understanding this entire issue – “you shall not bow down to them [the graven images – statues] or serve them.” When I tried researching about this verse, I found an interesting insight as I looked at the original Hebrew with which the Old Testament was written. “Bow down” or shachah (שָׁחָה) and “serve” or abad (עָבַד) both mean the same thing – to worship. I saw in the dictionary that worship means “adoration of a deity.” Therefore, it became clear to me that what God prohibited was not the creation of statues and religious icons per se – but the act of adoring them and considering them as gods! I also realized that we have to take the whole context of Exodus 20 into consideration. I think what God really spoke against was the worship of false gods that the people did when they were adoring nature, the animals, and the skies. Hence, God didn’t want them to make statues of their likeness and worship them. Bowing doesn’t always imply worship or adoration. While bowing is definitely one of the signs and gestures of worship, I have realized that not all bowing are acts of adoration. When two Japanese politely greet each other by bowing reverently, I think I’d be absurd to conclude that they are worshiping each other. The same goes for people giving honor to the king and other members of a royal family or even just the elderly! Solomon bowed to his mother Bathsheba (1 Kings 2:19). Another thing that blew me away is that in Revelation 3:9, St. John records the words of Jesus saying that those who are of Satan “will come and bow down” before our feet. When I came back to the Church, my mom knew that God heard her fervent prayers. I finally understood the purpose of our religious icons at home and in the Church — to direct our attention and contemplation to God and His saints who were faithful to Him. Going back to the Catholic Church was something I didn’t see coming because I told myself that I would never be back. However, God’s ways are higher than my ways and being Catholic again is the best thing that has ever happened to me. I have many stories in the course of my conversion, but I don’t have enough space to share them all here. Here’s one request that I’d like to make, especially for non-Catholics – whenever you see a Catholic bowing reverently or praying prostrate on the ground before a statue of Jesus, Mary, and the saints, instead of thinking that he’s an idolater help him pray to God for his intentions. And when you get the chance to ask him about his gesture, don’t be surprised when he tells you he is not worshiping that statue. He may not give you all the Bible verses you’d like to hear, but trust me when I say that he knows very well in his heart that those statues are not his gods. Can those saints hear him? Aren’t we supposed to pray only to Jesus alone? Why do Catholics worship Mary? I know you would ask those, and I will discuss those in my next blog post. For now, let us constantly ask from God the humility to avoid judging the internal dispositions of people based solely on external manifestations. My friend, there’s so much goodness and beauty yet to be seen in the Catholic Faith. I hope you could keep an open mind and study it further with an open heart. I am just here to guide you. I invite you in this journey to rediscover this “pearl of great price” that millions of people offered their lives for. If you want to connect with me, just click the Messenger button you’d see at the bottom of the page. Photos from Wikimedia Creative Commons and Unsplash. Originally posted at Bernz O. Caasi. Wonderful testimony. I remember coming home after a charismatic renewal weekend and told my mom the Buddha statue in our home had to go (a treasure she got on a trip to India ) and explained why. She got it and out went Buddha. Thanks for sharing – wonderful our church ya! Thank you for the sharing.This really helped me to clearify some questions of idolatry thrown at me by other Christian brothers.Praise the Lord. Thank you for sharing your experience. I enconter protestants in that attitude so often. I discovered that most protestants I have met aren’t evangelized but prejudized. and to think that all that disgraceful behaviour could have been avoided if you had started getting fundamentalist with “HONOUR your father and your mother”. I noticed no mention of apology, repentance or acknowledgement of your own sin; the story comes across as virtue signalling about reading yourself back from your prideful errors.